Melanoma is a serious type of skin cancer associated with the melanocytes, the cells that product the pigment that gives your skin its color. Because melanoma is usually the result of excessive exposure to the UV radiation, it most often develops in areas that have had exposure to the sun, such as your back, legs, arms and face. However, it can also occur in areas that don't receive much sun exposure, such as the genitalia, eyelids and soles of your feet or palms of your hands, particularly in the case of people with darker skin. In either case, melanoma is thought to occur when the skin’s normal pattern of cell regeneration goes awry and new cells begin to grow out of control until eventually forming a mass of cancerous cells. What makes these cells cancerous is their damaged DNA. What damages their DNA is usually linked to the overexposure of UV radiation from the sun, as well as tanning lamps and beds. In addition to UV light exposure, other factors may increase your risk of melanoma, including a fair skin type, previous experiences of severe sunburn, and genetic history. How can melanoma be detected? Usually, the first symptom of a melanoma is the visible change in an existing mole. The American Academy of Dermatology provides an easy-to-follow guide to help you detect the possible growth of melanoma in an unusual mole. However, melanoma doesn't always begin as a mole. It can also occur on otherwise normal appearing skin. In either case, it is important to remember melanoma is a skin cancer, and if left alone, it will spread. What happens if melanoma is detected? When detected early, it can be treated successfully, which is why we always encourage a yearly consultation. We cannot emphasize enough the importance of a total body skin exam every year. And remember to always be aware of the moles on your body. How is melanoma different from basal cell and squamous cell carcinoma? Sometimes called non-melanoma skin cancer, basal cell and squamous cell carcinoma do not develop from pigment-making cells. Together, they are the two most common kinds of skin cancer. Basal cell carcinoma accounts for more than 90% of all skin cancers in the United States. Typically, it is a slow growing cancer that seldom spreads to other parts of the body. Squamous cell carcinoma also rarely spreads, but does so more often than basal cell carcinoma. 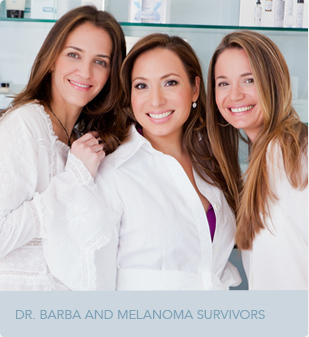 It is important that skin cancers are found and treated early because they can invade and destroy nearby tissue. Both can be removed from the skin quickly and easily with an in-office surgical procedure.